myblu™ liquidpods are used with the myblu™ rechargeable device. myblu™ liquidpods are available in a variety of flavours and strengths so there are many different vaping experiences to choose from. How do e-cigarette liquidpods work? Liquidpods, contain the e-liquid that is turned into vapor before being inhaled. All of the e-liquid comes pre-filled inside the pod, meaning that it couldn’t be simpler to change flavours on your device or when your liquidpod runs out. Just click in your pod and vape. Liquidpods connect directly onto the battery and have a mouthpiece attached, so there’s no need for any additional parts. Liquidpods connect directly to the battery by taking the clear plastic end and inserting into your battery. You should notice a "click" when the pod attaches to your battery. You're now ready to vape. What flavours and strengths do liquidpods come in? Our liquidpods come in a wide variety of different nicotine strengths and flavours. Having this variety allows you to choose the strength of e-liquid that suits your vaping style and enjoy the flavours that you love without compromising. 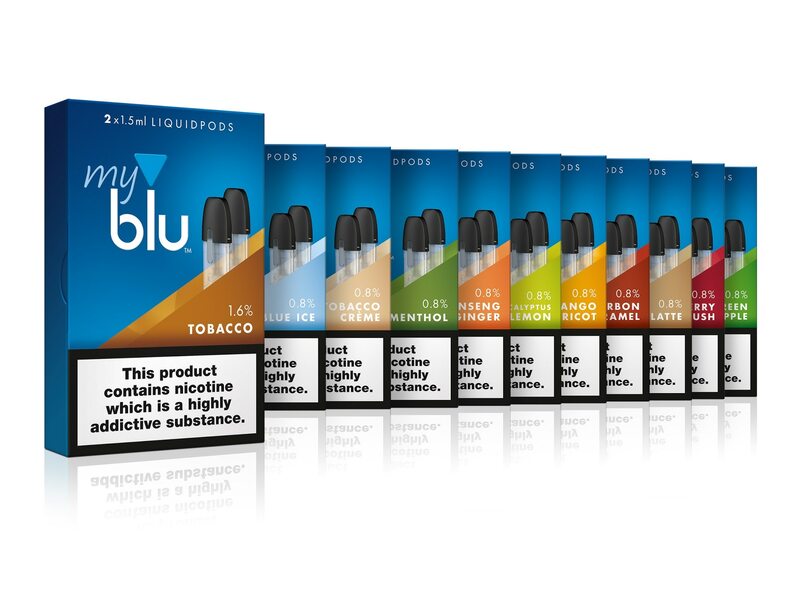 myblu™ liquidpod nicotine strengths range from 0% (no nicotine) to 1.6% nicotine strength.